The stonemason's lodge accomodates experts at cutting stones. With every level, the stability of buildings and wall in the same village increases by 10%. 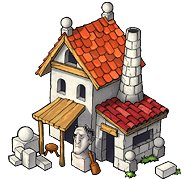 Please notice that the stonemason's lodge can only be built in the capital. The level dependent attributes (such as construction costs, generated culture points and durability) can be found here.